Our 2019 Spring Concerts will be on May 4 & 5, 2019 at North Kingstown High School. The Chorus will present "Listen to the Music," a celebration of the joy of music in song. This spring concert will feature both our adult and youth choruses. See our flyer below for more information. The North Kingstown Community Chorus is the largest performing arts group in North Kingstown with a group of over 100 singers. We sing it all: musical theatre, folk, gospel and contemporary songs. Concerts tickets are $10.00 in advance and $15.00 at the door. Children 8 and younger are free. 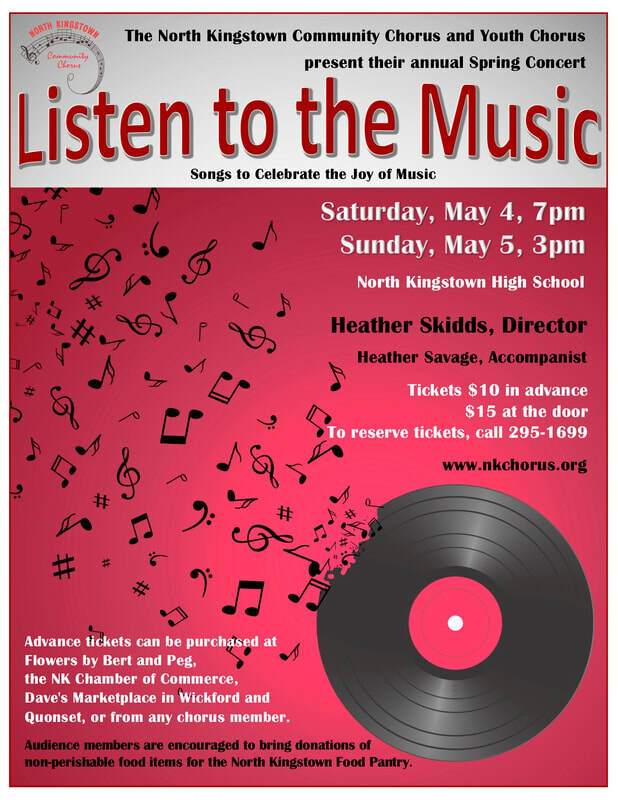 ​Tickets can be purchased at Flowers by Bert and Peg, the North Kingstown Chamber of Commerce, Dave’s Marketplace in Wickford, Dave’s Marketplace in Quonset and from any chorus member. You can also reserve tickets by calling Barbara at 401-295-1699. Listen to some tracks featuring our adult and youth choruses from our recent concerts. Listen to our interview on Classical 95.9 from January 2018. Our Director, Heather Skidds, speaks with Mike Maino of Conducting Conversations. Music from our recent concert is featured in the interview.